MORRISON CROSSROADS--On Monday morning, Randolph County Sheriff's Department received a call from the U.S. Marshals' office in Montgomery regarding warrants on a Hispanic male who was living at Watts Trailer Park on Old Highway 431 near Morrison Crossroads. Audel Cabrera Penaloza, 27, is wanted on three counts of kidnapping in Georgia and is also a person of interest n a homicide in North Carolina. The suspect is not from this area, but is believed to be from the Atlanta area. It is thought he has been in this area for about a month. Officers with RCSO, U.S. Marshals and Chambers County Sheriff's Office went to his trailer, but the suspect had run out of the back of the trailer. Chambers County Aviation and the Department of Corrections K-9 from St. Clair County were called to come and help in the search. The dogs picked up his scent and tracked him across the road and into a pasture where several horses grazed, but then lost him. They made several circles and backtracked, but the dogs did not pick his scent up again. After several hours in the heat, the dogs were tired. On Tuesday they heard he might be near Donald Wright's trailer park on County Road 88 in the Corinth North area and so searched up there, assisted by officers from Wedowee PD, Cleburne, Chambers and Lee counties, the ALEA helicopter and U.S. Marshals. On Tuesday afternoon, Sheriff David Cofield said, "We have been working all day, but do not have him in custody. We will continue to hunt for him and hope someone sees him and calls." 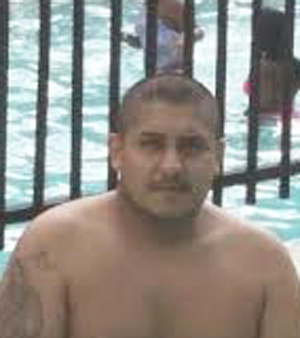 Penaloza is described as being 5-foot-10 and 180 pounds. He was last seen wearing a red shirt, dark jeans and sandals. His hair is shaved close and he has a large tattoo of a woman praying on his upper right arm.